This easy dish is a tasty mélange of crisp vegetables, mushroom, and tofu stir-fried in schezwan sauce. It makes for an excellent, healthy starter and is super-quick to make when you have unexpected guests. Baby Corn- 4 to 5 nos. • Blanch the baby corn, carrot, and broccoli and keep aside. • Mix 1 tsp of corn flour in ¼ cup water and keep aside. • Heat 2 tsp of oil in a wok or a non-stick kadai. • Add the garlic and onions and stir fry for a minute or two. 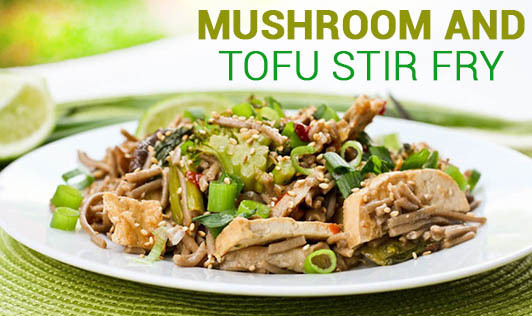 • Now add the baby corn, broccoli, bean sprouts, carrots, tofu, and mushrooms, and sauté for 2 minutes. • Mix the tomato ketchup, sugar and corn flour paste together and add to the vegetable-tofu mixture. • Add the schezwan sauce and salt; mix well and cook for a minute. Note: You can use paneer or chicken instead of tofu.